The 2-megawatt AC or 3 megawatt DC project is net-metered, meaning that any excess energy the farm produces beyond the needs of MVCC will be measured and delivered to the grid so the college can be compensated by its utility company. The college spends nearly $1 million each year on electricity for its campuses, according to a statement by MVCC President Randall J. VanWagoner in 2015, and the new off-site solar farm is projected to offset those costs by about $90,000 in its first year. 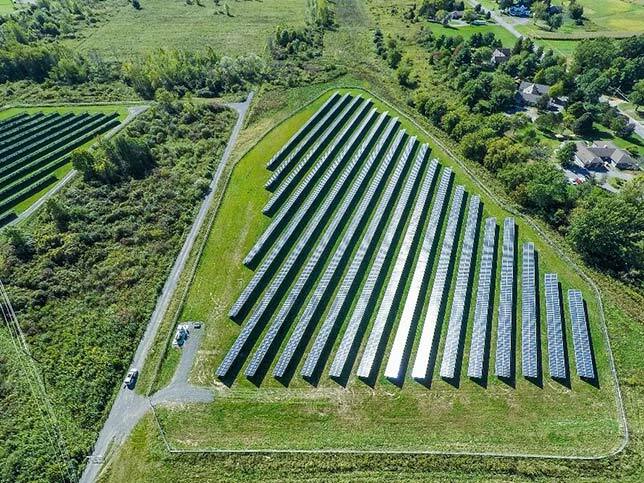 "With an electrical service technology program and solar teaching labs, a nearby solar site will provide even more opportunity for students to learn and train with hands-on experience," according to a report in the Utica Observer-Dispatch when the project was announced. "Once [students] graduate and go into the field, they need to have studied solar in some way while they were in college," Matthew Snyder, director of marketing and communications for MVCC, told the paper in 2015. "We are excited about this new venture that is good for our environment, good for our bottom line, and through this partnership, it will benefit our students as well," said VanWagoner, in a prepared statement. Funding for the project came, in part, from a grant provided by the New York State Energy Research and Development Authority (NYSERDA). The project was designed and built by groSolar and sited on land owned by the Rome Industrial Development Corp.